Cigarette smoking is closely correlated with high blood pressure, and new research indicates that it is also closely linked to damage to blood vessels and the build-up of plaque in arteries – a leading cause of stroke and heart disease. While the general public is aware of the obvious health links between smoking and lung cancer, fewer people are aware of the immense damage to heart health regular cigarette smoking can result in. Many of the chemicals in tobacco smoke actively harm blood cells. Doctors note that long-term smoking can lead to atherosclerosis – a disease that results in large-scale plaque build-up in your arteries. This plaque can stiffen over time and significant reduce the blood flow of many of your body’s arteries, reducing the amount of oxygen-rich blood that can travel to essential organs such as the brain and elsewhere in your body. Over time, atherosclerosis significant increases the risk of developing heart disease, arrhythmias and stroke. It also makes conditions such as high blood pressure, which are already prevalent among cigarette smokers, more dangerous. 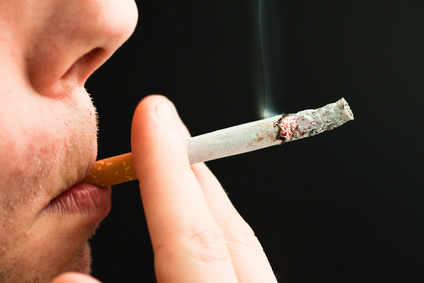 Researchers state that even occasional smoking can cause serious damage to heart tissue and blood vessels. Artery blockages are thus one of many reasons to make it an important priority to quit smoking. In addition to the heart and blood vessel damage caused by cigarettes, alcohol is a major risk factor for high blood pressure and heart disease. Excessive consumption of alcohol is closely correlated with prehypertension and high blood pressure. Despite this, people who consume one serving or less of alcohol per day (such as a single glass of wine or beer with dinner) typically have lower blood pressure levels than their peers who consume no alcohol. The key to healthy blood pressure, then, is simple: a smoke-free lifestyle with light, occasional alcohol consumption and regular exercise. Quitting smoking today could be your first step towards a healthier lifestyle and lower, safer blood pressure.